Mattress thickness is always a matter of preference. Some people may like a thinner 8 inches, while some may want a super thick 14 inches or more. While it is a matter of preference, it is recognized that 12-inch mattresses are among the best in many regards. From offering a comfortable amount of thickness to having great durability and extra features, these mattresses tend to be within the premium line of beds. While there are no special benefits of 12-inch mattresses, you’ll find that most of these beds offer various features within their class. For example, memory foam beds in this size tend to use more layers, or hybrid beds tend to have premium coils. In general, this is the sweet spot where you find the most benefits while still being fairly affordable. Have you heard of green tea mattresses? These are foam mattresses that replace some of the petroleum with green tea extract when forming the foam. Not only is this eco-friendly, but it also imparts many of green tea’s natural benefits like being an antioxidant and reducing bacterial growth. Outside of the tea, this bed has several layers that build up to one incredible mattress. The 7-inch base layer is very firm foam that is specially ventilated to reduce heat, while the top two layers (a 2-inch and 3.5-inch, respectively), are gel-infused and softened up to give you a very comforting sleep. This bed is smartly shipped, meaning that it’s rolled in a box and easily shipped, and the green tea greatly removes the initial off gassing smell most mattresses have. There are many benefits here to choose from. The multiple layers are great, acting to keep you cool, comfortable and to improve longevity of the bed. The green tea extract removes many of the harmful chemicals used, and many believe it has healthy benefits. On the cons side, the foam is a little on the firmer side (which some may not like), and many people don’t believe in the green tea benefits. While the jury’s out on the antioxidant benefits, this does definitely reduce chemical usage and initial odors. This is a simple bed that gives you the major benefits you’d want in a premium 12-inch mattress. The bottom base layer is a husky 8.5 inches. Composed of high-density foam, this base layer makes the mattress a little firmer while improving the durability of your bed. The top layer you’ll be sleeping on is a 3.5-inch layer of CertiPUR memory foam, free from many of the hazardous chemicals found in other foams (like fire retardants, heavy metals and so on). 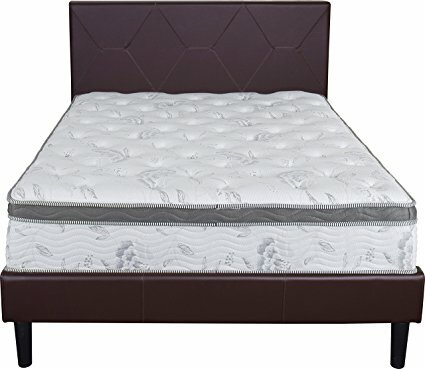 Considered eco-friendly, this foam properly supports you during the sleeping hours and distributes your weight so that no area is pinched or improperly moved. Like many other foam mattresses, this one can be easily rolled and shipped to your home. If you’re looking for a basic memory foam mattress made from eco-friendly materials and is reasonably thick and durable, then this is it. It hits all the big areas that you’re looking for in a great mattress. At the same time, it doesn’t really have any special benefits that can’t be found with other mattresses. It’s basic, but basic isn’t always a bad thing. Coming in a medium-firm feel, this mattress is in the sweet spot of not too firm and not too soft, making it ideal for people who dislike soft mattresses or who are new to firmer beds. Not only that, but the gel-infused layers are super comfortable and you’ll never want to get out of bed again. The 3-inch top layer uses gel-infused memory foam that responds to your bodyweight and keeps you properly in alignment while sleeping. Like most other foams, this one transfers very little motion, making it ideal if you move while asleep. Another major benefit is that this layer has an open design that allows air to transfer through, cooling the mattress so that you don’t wake up. You get the best benefits from memory foam here. From CertiPUR foam, to a great feel and cooling design, this mattress ensures you get a great sleep every night. Perhaps the only con with this mattress is that it’s a little on the firmer side, which some people may not like. However, as a medium-firm mattress, it’s definitely not too hard, making it easier for those who want the benefit of a firm mattress without feeling uncomfortable. This 12-inch mattress comes with more layers than any of the other beds on this list, each one imparting some special benefit that will help improve your sleep. Starting from the top and working down, there is a 1.5-inch layer of soft memory foam that surrounds your body and gives you a soft sleeping surface. Under that is a 1-inch layer of medium memory foam to support your weight, another 1-inch layer of firm memory foam to disperse weight and then a 2-inch layer of poly jacquard fabric that is ventilated. As a hybrid mattress, the bottom layer is 6 inches and composed of high-density coils that are each independent, meaning that little weight transfers as you move around. This provides the best benefit of coils, largely being great support and durability, while removing the weakness of motion transfer. While the numerous layers may be overwhelming to some, this gives the mattress more benefits that nearly every other mattress here. It’s also incredibly comfortable, very durable and it will make your journeys to dreamland all the better. On the bad side, this mattress is on the softer side (which may upset some sleepers), and it’s somewhat heavier than other mattresses, weighing about 100 pounds. Plush beds are the last word in softness, and few beds are as soft as this one. Made with three different layers, this 12-inch mattress is made specifically to keep you soft and cool through the night. At the bottom there is a very durable 8-inch layer of coils, each heavy gauge and individually wrapped. Above that is a 2-inch layer of transition foam, and then another 2-inch layer of gel-infused layer. These are each very soft, ensuring that you have a very plush bed that you can sink into at night. Not only that, but the gel layer is made to dramatically reduce heat while properly distributing your weight. There is also very good edge support to help the mattress keep its shape for many years. If you love plush beds, then this will be amazing. It’s the softest bed this brand offers, and it has additional benefits of keeping you cool, being very durable and just feeling comfortable. However, if you don’t like soft beds, stay away. While all of the benefits are great, if you’re unwilling to sleep on a soft surface or if you need something firm, then this bed won’t work for you.